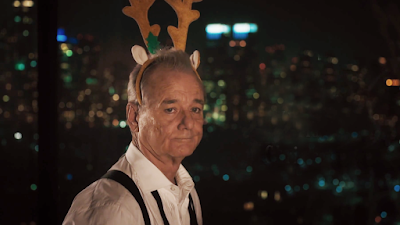 The quirky special opens with Bill Murray in his hotel room with Paul Shaffer, both playing themselves. After a quick blues tune, Amy Poehler and Julie White barge in, somewhat confusingly not playing themselves. They're producers, here to drag Bill downstairs to perform for a live TV special, despite the fact all their other guest stars canceled due to a storm. He's under contract, after all. The power cuts out due to the storm, which nullifies the contract. Chris Rock takes off in the confusion, and the producers gleefully call the special off and leave, as well. Bill Murray collapses on the floor, and the scene cuts away to him waking in a massive set, preparing for the musical extravaganza the storm had denied him. I honestly wasn't sure whether he'd died and gone to heaven or if this was supposed to be another dream sequence (it was the latter - having him die would have been gutsier, but I suppose you only get to pull that twist once per career). Up pulls a sleigh carrying George Clooney and Miley Cyrus, who sing several songs with Murray. Very little happens, but Murray seems satisfied for the first time in the special. Eventually, he wakes up in his hotel room on Christmas day. There's one last short musical number, then Murray wishes a Merry Christmas to his friends and everyone else, looking out the window over the city of New York (conspicuously lacking the snow from the prior day's storm). There's some good comedy and fun musical numbers, but those elements aren't exactly rare in this genre. What this thing has going for it is production value, mostly due to the direction of Sofia Coppola. I'm one of a very small number of people who found Lost in Translation overrated, but I certainly don't deny she's a good director. Every shot in this special is beautiful and visually fascinating, even when the story meanders. The musical numbers are nothing special, aside from the song choices and star quality of the performers. Along with obvious classics (Let it Snow, Baby It's Cold Outside, etc. ), there are some surprising additions, like A New York Fairy Tale and Santa Claus Wants Some Lovin' (Clooney's backup singing for that is pretty hilarious). These are a bit of a mixed blessing, though - at times, they almost seem more like viral videos than part of a whole. The special is certainly worth seeing, though, thanks to Murray's presence and Coppola's direction. The writing is clever - witty, even - as the characters deadpan their way through this quirky and irreverent musical deconstruction. Just don't expect something revolutionary.